According to champion fencer Stacey Johnson, sometimes to make change one has to challenge not just the status quo, but whoever governs it. 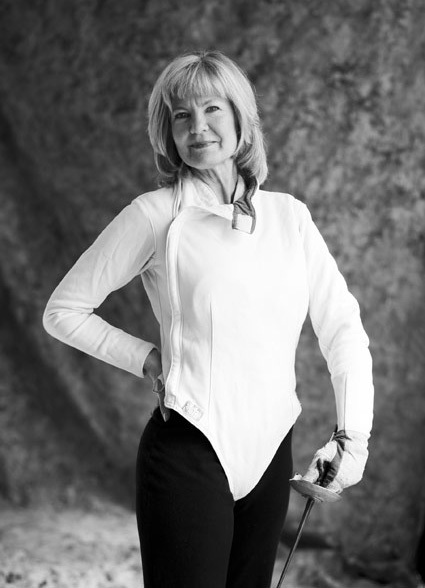 The first woman to hold a four-year position as president of the United States Fencing Association (2000-2004), Johnson, ’80 Public Relations, made it her mission to “speak actively for women,” because woman fencers were limited to compete using the foil, while their male counterparts could compete in foil, epee and saber. Among her many strategies to create opportunities for woman fencers worldwide: get American seats on every International Fencing Federation commission, gain support from Pan American countries and create a coalition to advocate on behalf of woman fencers everywhere. From 2000 to 2004 together with her allies, Johnson engaged athletic leaders from around the world in a serious conversation about the fate of their sport: How could they achieve gender equity across the three disciplines of fencing? Most importantly, how could they bring women’s saber to the Olympic program in 2004? Before Johnson’s career took her to the U.S. Fencing Association, before she joined the U.S. Olympic Committee Board of Directors or qualified for the 1980 Olympics, she was a fiercely talented fencer at San Jose State, a four-time All-American athlete whose love of sport started as a girl in Europe. Growing up in a military family, she learned how to ride horses on her father’s Air Force base in Italy before relocating to San Antonio, Texas. Johnson’s interest in horseback riding led her to modern pentathlon, a sport that combined riding, shooting, fencing, swimming and running. Even as a young girl, she had a knack for creating opportunities for women and girls in sport where it appeared there were none. 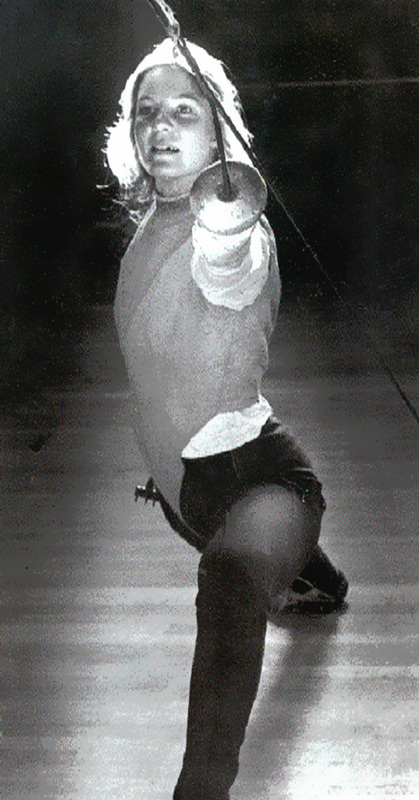 She began taking lessons with the French fencing master Jean Gerard Poujardieu at age 11. Initially instructed to train with her right hand, Johnson didn’t fare well until her instructor put the foil in her left hand. The product of Catholic schools, she had been trained to be right-hand dominant, though in reality her left hand proved to be a much better tool. Something happened when the power shifted from one side of her body to the other. The sport armed her with skills she didn’t know she had—athletic talent, but also a tenacity of spirit that paved the way for competition, college and eventually the Olympics. Johnson was admitted to San Jose State a few years after the passage of Title IX, legislation that created more opportunities for woman athletes nationally. She was one of the first 200 women to receive an athletic scholarship in California—support that made it possible for her to pursue an education. Her prowess with the foil was unmistakable. Though she didn’t have the height or stature of her teammates Gay (then D’Asaro) MacLellan, ’83 MA Kinesiology, or Vincent Bradford, ’78 Geology, she was fast, determined and strategic. Named an All-American every season from 1976 to 1979, she was a two-time National Intercollegiate Women’s Fencing Association individual champion and led the Spartans to four national championships. When she and teammate MacLellan qualified for the 1980 Olympics in Moscow, they were overjoyed. Then the news came that the U.S. would be boycotting the games, and that American athletes would be prevented from competing. Crushed, Johnson decided to invest her disappointment and frustration into creating more and better opportunities for woman fencers. If she couldn’t participate in the Olympics, she wanted to multiply the chances that other women could realize their Olympic goals. And so she created a plan to “infiltrate the governance structure” of the sport. First step: She and MacLellan became the first two women on the Fencing Officials Commission—and two of the first women to obtain international referee licenses. It took years for Johnson’s coalition to get the support it needed to allow woman fencers to compete in epee and saber at the Olympics, and it involved some sacrifice. By having more women fence in individual events, it impacted the number of medals awarded at the games—which in turn affected which competitors would be allowed to compete. It was 2004 before women could compete in all three events at the Olympic level. Fittingly, the games were held in Athens, Greece, where the Olympics are said to have originated. Watching Mariel Zagunis win gold and Sada Jacobson take home bronze in saber, Johnson was proud to see American women prove long-held assumptions about woman athletes wrong. “They were spectacular and they were brilliant fencers,” she says. While she was changing the future of fencing, Johnson juggled an active career in academia. After completing her degree at San Jose State, she rose through the ranks at Palo Alto College in San Antonio, Texas, part of the Alamo Community College District. Starting as the director of marketing and eventually becoming dean, chief instructional officer and vice president of academic affairs. 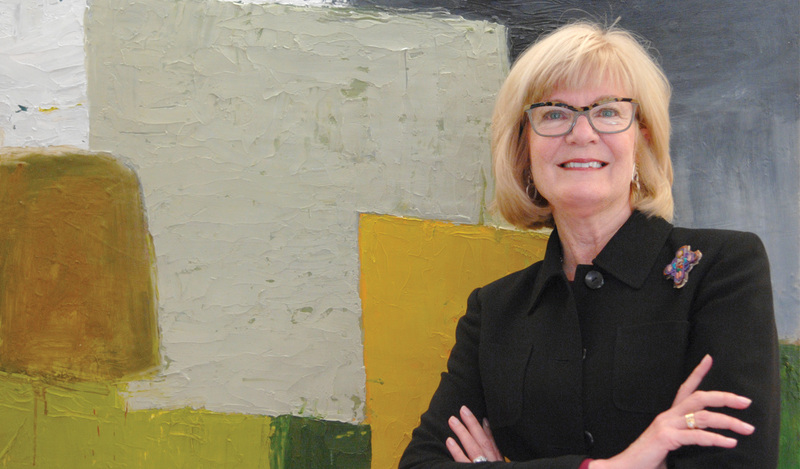 In 2012, she became the president of Valencia College’s East and Winter Park campuses in Orlando, Florida. Her commitment to higher education echoes her belief in the need for equal opportunities across the board. She says that the key to social change, in sport and beyond, is education. Though Johnson no longer fences, she remains an active influence in the fencing community. Recognized by the College Sports Information Directors of America (CoSIDA) in 2017, she was inducted into the Academic All-America Hall of Fame last June. Stacey Johnson’s story represents a long tradition of outstanding woman student-athletes at San José State. From Olympic swimmer Lynn Vidali Gautschi, ’76 Kinesiology, ’77 Teaching Credential, to record-breaking gymnast Thomasina Wallace, ’12 Kinesiology, generations of Spartan women have led successful careers in sport. Read The Women in Sport Stories.